•	Opens Monday, April 1 and runs thru Friday, April 12! •	Open daily 7:45 a.m.—3:45 a.m. Students accompanied by parents time! during the first 10 minutes of their language arts block! •	Closes on Friday, April 12 at 2:30 p.m.! Book Talks—Daily during morning announcements! Students drop in “Change” (pennies, nickels, dimes, and quarters) into their grade level’s box as often as possible during the book fair. The grade level that contributes the most money will have a Movie & Popcorn Party! Student Contests/Drawings—Daily Prizes! 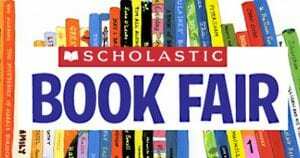 PLUS, a Special “Starbooks” Café Event for all students who purchase books! *Parent/Family Day—Thursday, April 4 from 7:45 a.m.—3:45 p.m. Special Drawing! *Grandparent Day—Friday, April 5 from 7:45 a.m.—3:45 p.m. Special Drawing! •	Shop more selections with our Online Book Fair April 1 thru April 12. •	Create classroom and personal wish lists, and email them to family & friends! •	Set up your eWallet account! •	Download the “Book Fairs” App to enhance your Book Fair experience/knowledge!